The Amerex stored pressure fire extinguisher is the hallmark for quality in the fire extinguisher industry. These extinguishers have proven their dependability in heavy industry usage and repeated recharging with no essential changes in over 30 years. Coupled with rugged, dependable steel cylinders and stored pressure (gauge type) design. ABC or Multipurpose extinguishers contain a specially fluidized and siliconized mono ammonium phosphate chemical manufactured by Amerex. It chemically insulates Class A fires by melting at approximately 350 degrees F and coats the surface to which it is applied. It smothers and breaks the chain reaction of Class B fires and will not conduct electricity back to the operator. 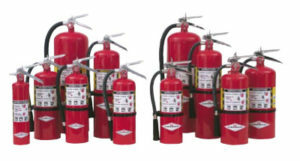 ABC wheeled and stationary extinguishers are available in a variety of types and sizes.